Fall weather finally made its way to Pittsburgh, so I stocked our freezer with six batches of our favorite crockpot soups. 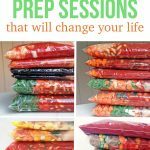 All I had to do was prep the veggies and combine the ingredients in gallon-sized plastic freezer bags. No cooking required! I had a few of the ingredients on-hand and bought the others at Aldi for $45.57. I bought all of the organic ingredients that were available. If you’re new to freezer cooking, you’re going to get hooked. 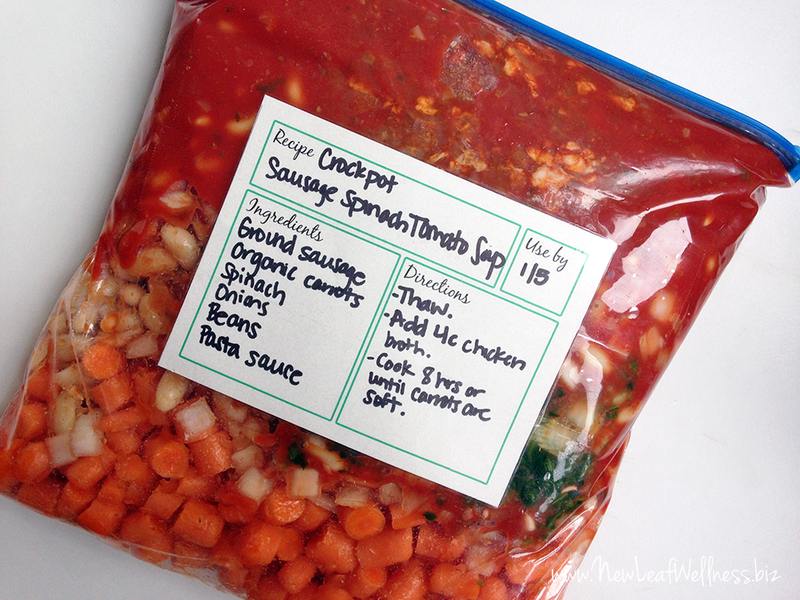 There’s simply no way easier to feed your family homemade meals on a consistent basis. 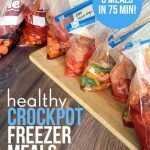 What’s so great about these crockpot soup freezer meals? They’re healthy recipes that your whole family will love. 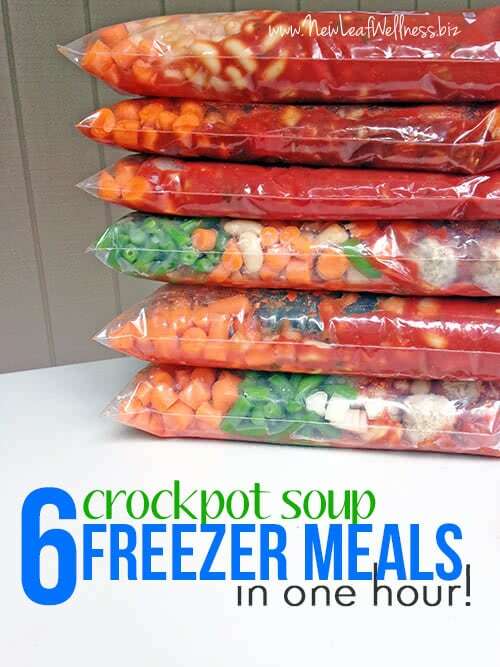 I froze all of my crockpot soups raw, so they were very easy to prep and won’t taste like leftovers at all. 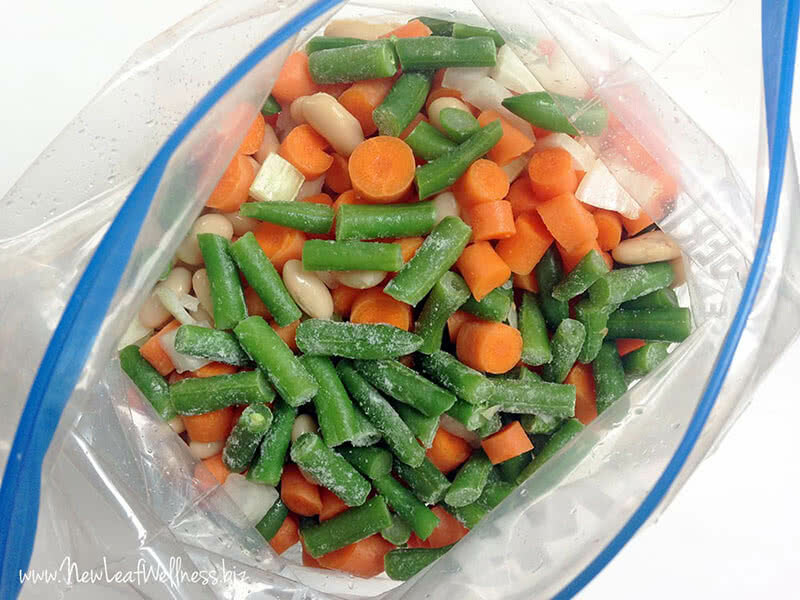 I know some people aren’t used to mixing raw meat with vegetables, so I did a lot of research when I was writing my No Cook Freezer Meals cookbook. According to the USDA Food Safety and Inspection Service, freezing to 0 °F inactivates any microbes present in food (such as bacteria, yeasts, and molds). That means freezing raw meat with vegetables, sauces, and spices is perfectly safe. I bought organic baby carrots so I wouldn’t have to peel them. I used a food chopper (affiliate link) to dice my onions. I did all of my grocery shopping ahead of time. I got out all of the necessary ingredients. Then, I opened all of the cans and worked in an assembly line to fill the bags with their vegetables, beans, sauces and spices. I added the meat to the freezer bags last so it will be the first ingredient poured into my crockpot. P.S. Here’s an update from my ground beef freezer prep session: Aldi’s freezer bags were a flop! One ripped when I was sealing it and the zipper on another bag popped off into my crockpot and I cooked it with my soup. (Whoops!) 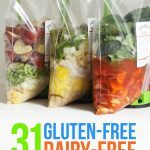 Needless to say, I’m back to using my old reliable freezer bags (affiliate link). 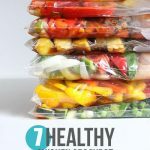 Make 7 Healthy Chicken Crockpot Freezer Meals in Under an Hour! These look great! I noticed you use organic veggies and wondering if you also use organic meat? I have a hard time finding organic ground sausage in my area. I use organic meat if I can find it. It’s not always available at Aldi or other stores that I shop. If you prefer ground beef or ground turkey, you can substitute either one. I even have a blog post about how to season them like sausage if you like the sausage taste. I love making freezer meals. I just made 8 meals in a little over 1 your. I love having them in the freezer ready to go. Do you have any of these recipes that are vegetarian? 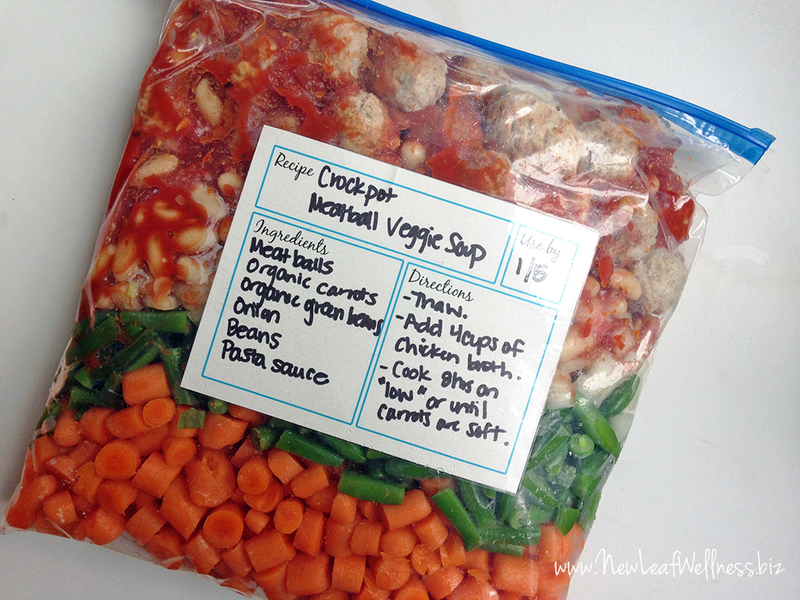 You could omit the meatballs or sausage and add an extra veggie instead. Zucchini, yellow squash, or corn would be great! I’ve also frozen uncooked barley in vegetable soup for my slow cooker. Thanks, Carrie! I’d love to hear what you think. You put the sausage in without cooking and draining it first? If I were to do that, do you think it would alter the flavor? The texture will be slightly different, but the flavor will be good. Just cool it to room temp before freezing. Love this list! I’ve done some freezer cooking the past but kind of fell off the bandwagon since having my 3rd child 8 mo. ago. This is motivating me again. Thanks! Ps. You know that Aldi has a money back guarantee on their stuff, right? I’d take that box of bags and your receipt if you have it with you to the store the next time you go and they should refund you your money. My store has always been super good about it the handful of times that I’ve had an issue with their products! Thank you so much, Lydia! I didn’t even consider that! I got back to freezing when my third baby was about 8 months old too. It feels so good to be on top of things again. You can totally do it!